Star Wars Episode (VIII) 8 was one story that really was something we haven't seen in any Star Wars movie to date, which is why you will want to see it twice to fully enjoy it. Cast: Mark Hamill, Carrie Fisher, Daisy Ridley, Adam Driver, John Boyega, Oscar Isaac, Andy Serkis, Domhnall Gleeson, Kelly Marie Tran, Laura Dern, Gwendoline Christie, and Benicio Del Toro. Pros: Mark Hamill did amazing playing Luke and was refreshing getting to experience that character again. His reprisal of Skywalker came close to an Oscar-worthy performance. Poe Dameron had some sick skills when shooting down TIE Fighters but in The Last Jedi, you get to see more of those skills which sets him apart from all the others, truly a genius in the air and space. Kylo Ren and Rey both struggling in finding their place in the galaxy provided a fresh perspective on the Force and how it balances. Leadership skills are not to be taken granted, Poe learned a hard truth in that. Action scenes were beautiful, either with a lightsaber or not. New creatures in this galaxy from far far away initially bugged me but in the end were okay to have around. A lot of exploration into the "Force" and I loved that. Cons: Story was good but not great. There was a chunk of a storyline which I won't spoil that could have been totally left out of the movie. Wish we got more of a backstory or action from Captain Phasma. The Last Jedi revolved in three certain areas and some scenes out of two of the three didn't make much sense. Some humor was forced and you could tell it was Disneyfied but some was great when it needed to be. To really enjoy and appreciate The Last Jedi you might have to see it twice and that is something I've never had to deal with. The first time, a lot of the storyline bothered me but I grew to appreciate it more after another viewing. All the pieces fell into place. 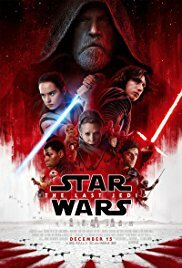 The Last Jedi is not even close to being the best Star Wars movie but it sure is one that was different from the rest.